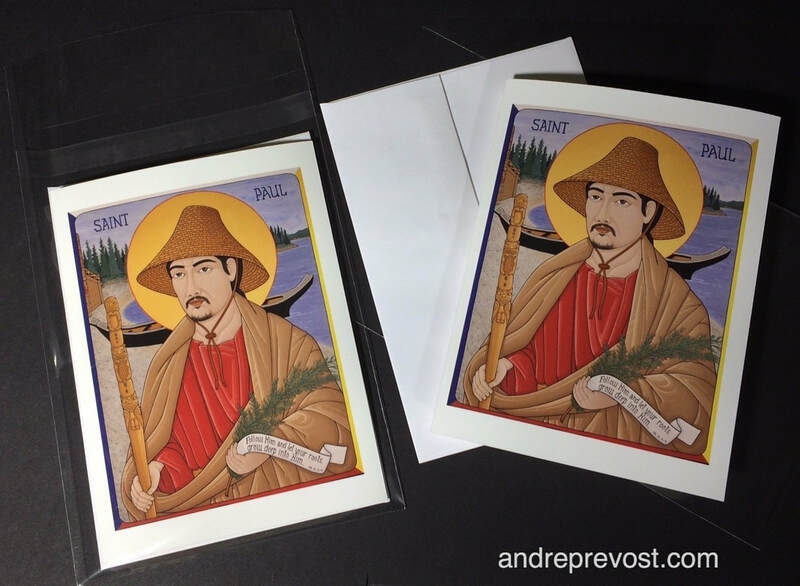 Father Laboucane is interested in having greeting cards made for the new icon of St. Paul. My contact at CanvasPlus and I had been trying to get a sample card done through another printer, but the printer wasn't able to follow through. So my contact printed a few cards himself, using the more expensive 'cotton rag' printing (high quality), so that Father Laboucane can see firsthand what a greeting card may look like. I'll be sending him the sampling in tomorrow's mail. The St. Paul icon has been completed, But before I give it 2 coats of varnish, my quest is to try and get a picture of it that is square to the frame. Once varnished, the glare makes it very difficult in the space I now have, where I don't have enough space to avoid the glare with the lighting. I am also attaching the Commentary on the icon. - and then a few tweaks in general. The last step will be finishing the Four Directions colour frame. The white and yellow paint colours always need more coats as they are always more translucent then the other colours. The Commentary for the icon is also completed. Progress on the St. Paul icon continues. I've been working on the background and cedar hat. I've been working full time on the icon of St. Paul (a long way still to go). I know that you will ask 'St. Paul'? And the answer is 'yes'. 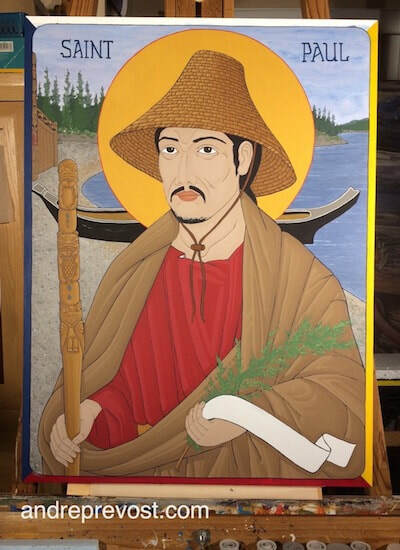 At first, the the original composition portrayed a more traditional St. Paul within a Coast Salish setting, and holding a talking stick and had a cedar hat resting on his back, hanging on the band around his neck. The conversation that followed around the icon asked that St. Paul be wearing the cedar hat. 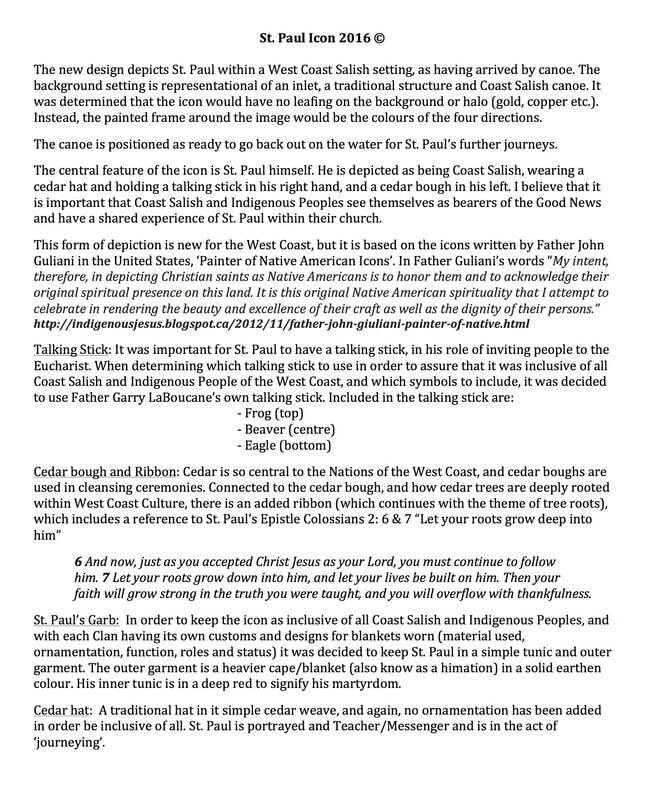 The pivotal discussion then posed the question of portraying St. Paul as Coast Salish, to portray the modern St. Pauls who are continuing the work, and so that the Coast Salish and Indigenous Peoples can see themselves within their sacred art and church. Father Guiliani from the United States was the example for such icons for the 'American Indians'. Father Giuliani states that "It is [their indigenous culture] especially that I celebrate in rendering the beauty and excellence of their craft as well as the dignity of their persons" (Painting as Prayer: Interview with Father John Giuliani). I also began to wonder how Native American Christians feel about Giuliani's depictions of them in his icons. Judith Dupré quotes Father Giuliani as saying: When the Lakota Sioux throughout the Dakotas, most of whom had been evangelized by Jesuit missionaries, first saw themselves depicted in my works as saints, they were ecstatic. Many of them contacted me, weeping even, and said, We have never before seen ourselves depicted as Mary, as Jesus, the saints. As I write this icon, I am also putting together the notes about the icon so that both the parish and I can have the background on how the icon came to be and why, and what is all included within it. Once I have that completed, I will post it here as part of my Icon Journal. I am hoping to have the icon completed, including the inscriptions for 'Saint Paul' and the scriptural reference to Col: 2, 6-7, by the end of next week (Nov. 5th-ish). 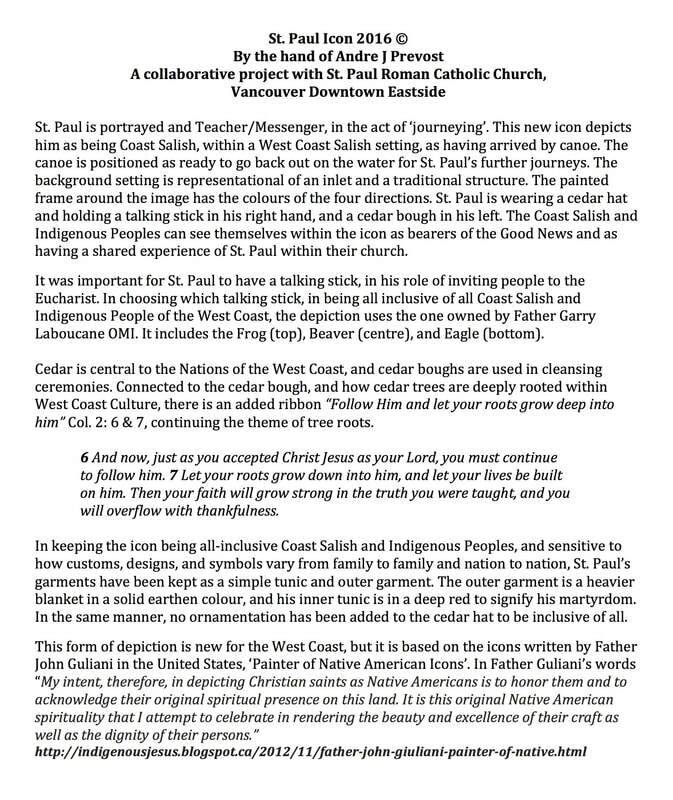 The revised design for the St. Paul icon has been completed, enhancing the Coast Salish context of the icon. I will post more background to the icon and a photo once the writing is further along. The image has been transposed onto the board, inked in, and I've spent the last few days in developing the base mid colours. This is the phase where adjustments are made to the colours so that each suits the overall balance of the composition and to correct how each is perceived next to its neighbouring colours. Neighbouring colours can completely change the appearance of a colour. There will be a number of interesting challenges in accomplishing some details within this design. It never surprises me when a new icon goes down a different direction then originally planned, especially when a new design is in the works. I received a voice mail yesterday from Father Laboucane with a simple enough question for the icon, which set another level of thought into motion. I had a great chat with him today which allowed me to process my thoughts and address my own footing in the process, in that it always came from a sincere place and sensitivity to the community the icon is for. So the icon is percolating and will guide as always. I'll redevelop the design within this new direction. I'm sorry that I can't go into the particulars of the transition at the moment. I want to receive a seal of approval on the new design before I present it online. All I can say, is that it will be completely new, and with a focus that addresses a need. I won't be able to get this done until after this coming weekend, once the Sidney Fine Arts Show has closed. I have a demo that I need to prep for on the 15th in addition to the trips for the Opening Reception and the Meet The Artists Event. The icon of St. Paul is basically confirmed, and I'm just awaiting final input on a few details. I've left the talking stick in pencil as I am waiting for jpegs of the actual talking stick to be used. Once I have that, I can finish the design and begin transposing it onto the icon board (24"x32"). Just a quick update to share how the icon board for the St. Paul icon is progressing. It is that finger breaking phase of adhering, gessoing, and sanding. Four coats of gesso and sanding has been completed. Have another four coats of gesso to do, and one final sanding. After that the next finger breaking phase won't be until it comes time to do any leafing. I don't usually do that until the image is more then 1/2 way along. With the board almost ready, I'm anxiously awaiting word about my design, so that I can begin transferring the image onto the gessoed surface. 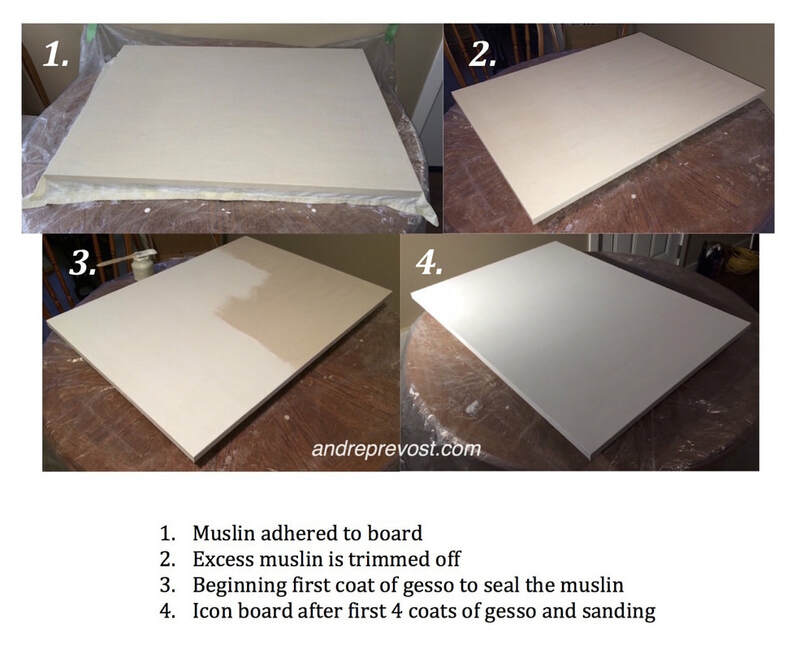 I received the OK to get the panel size cut and to begin preparations of adhering the muslin and starting the layers of gesso. I should have confirmation of the icon's design by the time I've completed the preparation, and the symbolisms which I've proposed for this original icon. Once the design is confirmed, I can post more information. An icon commission for a church in the Vancouver Downtown Eastside has been discussed for a while but is now entering the design stage. More information to come once the composition and symbolism details are ratified. It has been an icon which I've been wanting to help make possible, and dear to me heart; both for the community and for a very dear friend.